Huygen's Horologium Oscillatorium. It's mechanical wonders astonish; I count myself fortunate to live in an age that sees such technological advances. I dread Fridays more than most. Fridays are reserved for fencing lessons, and as mentioned before, they usually end with me flat on my arse, subjected to a stream of obscenities from Jack. Today, however, was better than most, for instead of my participation, Patrick and set up an exhibition match between Jack and the good Capt. Araoz. Now, I had some misgivings about this enterprise, as Jack’s opinions about Dago’s are well known to all who cares to hear about them. Spain purportedly has something to do with the death of his wife; one might conclude that his hatred of Papists like me is stirred by his irrational feelings toward King Philip and his brethren. Say what you might about Jack, but he is a mighty keen fencer, while Capt. Araoz is no slouch himself. At the first cross it was blades whirling, and Jack drew cloth. Things took a turn for the strange when it became evident that this was no mere contest, and more of a matter of pride. Jack and Araoz departed their line, and from there was all matter of jumping on tables and slicing off the tips of candles. 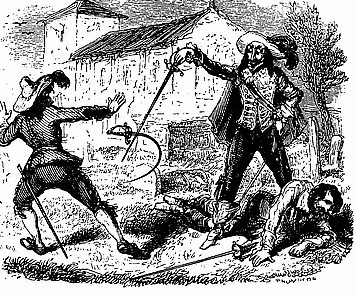 The effect was quite stunning, as you could see the two shadows looming behind them in their own duel of death, both locked arm and arm, Jack perspiring madly, with the Capt. maintaining his stance and letting forth little grunts of effort. Did I mention that Jack was perspiring? Well, he might be a fair fencer, but the years of drink and women began to take its toll after the third pass. You could see Jack mentally calculating how to extricate himself from a losing proposition, which he did in most spectacular fashion. With one last gasp of effort, he locked himself in a clinch with the Capt., and proceeded to knee him sharply in the groin and then strike Araoz across the temple with the pommel of his blade. The Capt. fell like a stoned donkey, and Jack quickly moved to the bar to have a drink. 2) a series of interviews with Dr. L to reveal the first case of J's flood of yellow bile, and, it is hoped, to thereby tame that flood [novel and completely unproven]. I cannot honestly say which remedy J will despise more. Perhaps S and I simply shouldn't tell him. I must consult further. London is a hornet's nest with news that Spain has discovered El Dorado. Every blackguard and tomfool has taken to a ship with hopes of plundering riches. They obviously have forgotten the likelihood of being eaten by a Kraken. I am no such fool. I have neglected this blog for nearly a month now, and some explanation is clearly required. However, I am not a man who apologizes where no sin has been committed, and I have learned from experience never to explain my actions without an attorney present, so you will receive no such satisfaction. 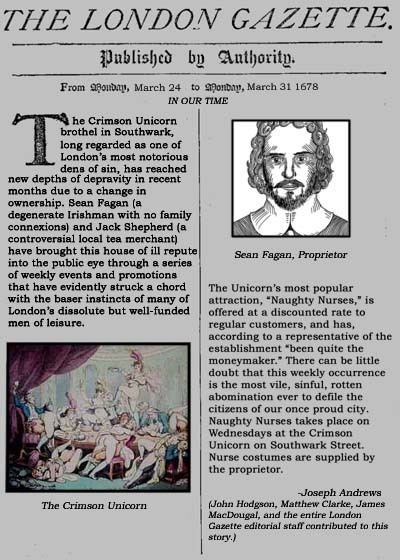 Suffice it to say that I have been occupied with business, particularly the day-to-day operations of the Crimson Unicorn, which is fast becoming London’s premiere bawdy house. Last week, we attracted more clients than our chief competition, Harry’s House of Harlots (or, as it is more commonly known, Harry’s House of Herpes), and, thanks to the recent addition of our immensely popular “Naughty Nurses” attraction, which was written up in The London Gazette as “The most vile, sinful, rotten abomination ever to defile the citizens of our once proud city,” we are poised to overtake even the notorious Black Orchid, which is reputed to be the favoured establishment of ill repute amongst discerning Members of Parliament. So, as you will imagine, I have had my hands full—and I might add that I have had very little help from Sean (my business partner in this endeavour), who—my sources have informed me—spent the entire day today lying in a ditch. Spent much of the day in a thicket. Fencing lessons with Jack today. I am quite the pincushion. Attempted to soothe my ego and wounds with bacon and quince. Not a delightful concoction. Patrick and I took my skiff out on the Thames today and partook of a leisurely lunch of strawberries and jam whilst discussing what is to be done about Jack. His rages have become more pronounced as of late and it has cost us money, time, and women with prodigious busts. Patrick has an idea of what he is about, and a plan in which to remedy the matter. I strongly doubt that Patrick’s method of treatment will prove successful, but remain hopeful that Patrick will surprise. I am not diverted. There was a chance tonight to retire with a flame haired wench with a prodigious bust. No small thanks to Jack, and several ill-placed comments about Monmouth, I find myself once again alone.